How to Cut Large Branches Off a Tree | Mr. Tree, Inc.
Do you have a large tree in your front yard or backyard and are wondering how to go about taking care of it? Look no further, as Mr. Tree Services is here to help you properly learn how to cut large branches off a tree. As your safety is our number one priority, we would first like to stress that if you are not comfortable doing this yourself, please call in professionals. We are more than happy to take care of this for you. However, if you would like to learn how to cut large branches off a tree yourself, these tips are for you. In addition to looking out for your safety, we want to look out for the safety of your tree as well. Because of this, making clean cuts to the tree is important as you do not want to damage the bark or accidentally interfere with the tree’s natural healing abilities. Once a branch is cut off from the tree, the tree forms callus tissue that covers the wound. This callus tissue acts as a scar that keeps disease and decay out of the tree. If tree branches are not cut correctly, this can be hazardous to its healing process, thus resulting in the tree becoming weak and potentially no longer growing. The first cut made to your branch should not be a full cut, but should instead be a small notch. This should happen at the bottom of the limb of the branch, approximately 2-3 feet away from the trunk of the tree. The cut should be made about a quarter of the way through. The importance of this first, not full, cut is that it will keep the branch from splitting when you make your next couple of cuts. Now that you have your notch cut made, which is holding the bark of the tree steady, you may continue with the next cut, which is a relief cut. This cut should be made right outside of the notch cut, and about a foot or more from where you will be making your final cut. This relief cut should cut completely through the branch, leaving a much smaller branch stuck to the tree, which should be small enough to be able to lift with one hand. The importance of this second cut is that it removes the weight of the branch from the rest of the tree. This prevents the branch from splitting and falling when you make your final cut. Now that you have made the first two cuts to ensure your safety (and the safety of your tree), you may go ahead with your final cut, which is the actual cut which will remove the branch from your tree. This cut should happen where the branch collar becomes the smooth branch bark. If you are unsure of where this happens, look for the swollen bump of sorts that is located at the beginning of your branch. When you begin cutting, be sure to follow the slant of the branch collar rather than cutting straight down. If it is easier for you and the tool you are using (we recommend a saw), make the cut from the bottom up. The importance of cutting the branch at the branch collar is because this is the area that will then form the callus tissue that will allow the tree to heal and continue to grow. These three steps are meant to make things easier for you, but it’s just as simple to cause more harm than good, which is why we also want to share some common tree trimming mistakes to avoid. It may seem like cutting the branch straight off the tree with the trunk is the right thing to do, but that is not the case. There should not be a hole in your tree trunk post cutting, as this will result in the callus tissue not being able to properly form. Trees have an extremely difficult time recovering from rotten holes or seeping wounds, which usually results from branches being cut too short. In contrast to the above, leaving the branch too long will not do your tree any good either. If the cut is not made on the branch collar, the callus tissue cannot heal as the healing area is still covered. Leaving the branches too long will prevent the healing process from occurring. Step two of the three steps we shared above is important. If you do not make the relief cut, you do not remove most of the weight before trimming. This will result in the branch splitting off, which should not happen. A branch splitting can cause damage to the trunk, which is vital to the health of the overall tree. If there is damage to the trunk, this can make the tree susceptible to disease and lead to a longer healing period. As you can see from all of the above, cutting off a large branch is a process. It is critical for your safety, and for the safety of your tree, that the branches are cut correctly. If it is not properly done, the healing process of the tree can be severely affected, resulting in future problems to your tree. Additionally, be sure that you are comfortable using a saw (or whatever tool you choose) prior to attempting to cutting the branch off a tree. 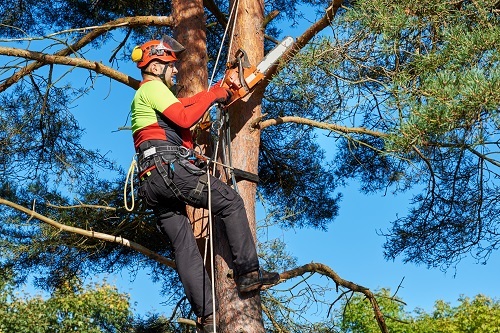 If you are not comfortable with this task, please give us a call as we are more than happy to come and look at your tree and remove any large branches that are at risk for falling or are creeping too close to your roofline. If you have any further questions on how to cut large branches off a tree, please give us a call. We’ll answer any questions or schedule an appointment with our experienced staff.